Both my husband and I are hooked on HGTV's All American Handyman. Probably because (1) my hubby is a handyman and (2) my dad was a handyman. We just started watching this season, and caught last night's final episode. I was a bit disappointed that Allison didn't win -- Jared ended up taking home the $10,000 grand prize, along with some sort of TV deal. 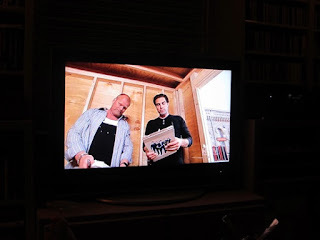 I wasn't surprised that the two All American Handyman judges, Mike Holmes and Scott McGillivray, are Canadian -- I heard it in their Canada speak while watching the show for the first time. Mike Holmes is well known to TV audiences. The 48-year-old from Halton Hills, Ontario is the host of Canadian TV shows Holmes on Homes and Holmes Inspection, and a judge on HGTV Canada's Handyman Superstar Challenge. A contractor by trade, in 2006 he launched The Holmes Foundation to support the training of youth in skilled trades through apprenticeships and scholarships. Holmes is also the author of two books, writes a weekly newspaper column and is heading up Wind Walk -- a sustainable development in southern Alberta. Scott McGillivray describes himself on his website as a "full time real estate investor, television host, executive producer, writer and educator." And he's also got really white teeth! The 33-year old was born in Toronto, and in addition to being a judge on All American Handyman, he's the host of HGTV's Income Property. McGillivray is a graduate of the University of Guelph, with an honor's degree in commerce. McGillivray and his business partner Michael Sarracini have developed the Lifetime Wealth Academy, a real estate coaching company specializing in real estate training and mentorship.